This beautifully designed villa offers more than 270m² of living space on its main part. The interior is neat, the beams and the terracotta floor give character. The double living room of 50m² with fireplace is very bright thanks to the large bay windows. The fitted and equipped kitchen is functional and is completed by a cellar/laundry room. On the night side, a toilet with washbasin, an office, 2 first bedrooms with shower room and a comfortable parental suite of 38m². On the first floor there is a shower room and 2 bedrooms, one of which gives access to the Tropézienne from where you can admire the panoramic view. Finally, the basement has a surprise in store with a 30m² disco room and a wine cellar. The 32m² independent studio will be perfect for entertaining friends or family. 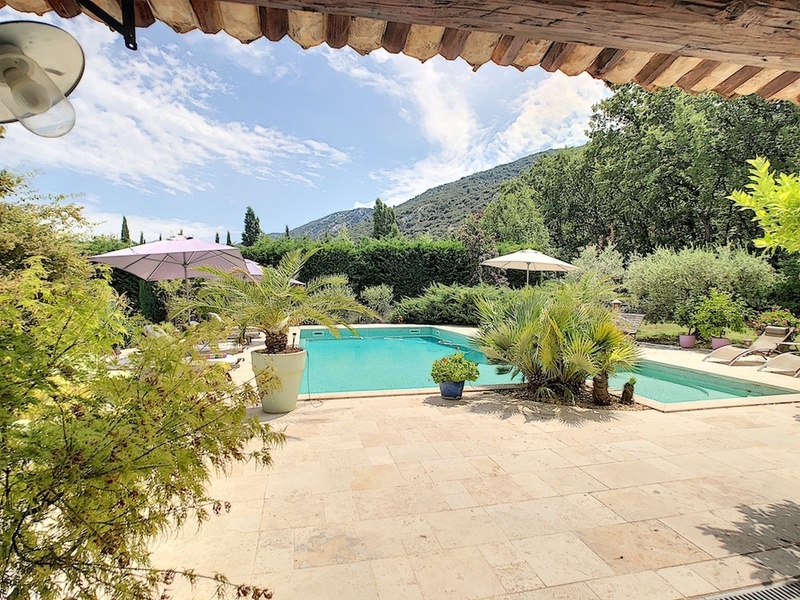 The beautifully sized swimming pool is perfectly integrated into the garden and extends into a magnificent pool-house as a summer living room for relaxing moments facing the pool and the Luberon. For comfort, a 38m² garage, a 44m² carport and workshop are at your disposal. The park of more than 4450m² planted with Mediterranean species is irrigated by drilling. The ideal house to live in all year round as well as for holidays! Access by motorway 15 min, TGV 25 min and Marseille Provence international airport 50 min.